When I was about half way through The Wednesday Wars by two-time Newbery Honor winner Gary D Schmidt I paused to wonder what book had won the Newbery Medal in 2008? The Wednesday Wars was proving very worthy of the buzz that surrounded it since it was published, a buzz that kicked up again when Schmidt's newest book, Okay for Now, came out in April of 2011, and I had to know what book was better than Schmidt's that year. As much as I love, love, love The Wednesday Wars, I am profoundly glad I was not one of the judges who had to make a choice that year. Laura Amy Schlitz's Good Masters! Sweet Ladies! Voices from a Medieval Village (which is every bit as different as it is as good as The Wednesday Wars) won the gold that year. The other honorees? Also a tough crowd with Jacqueline Woodson taking a silver for her phenomenal book feathers and the Newbery Medal winner Christopher Paul Curtis taking a silver for Elijah of Buxton. With Okay for Now, which was a finalist for the National Book Award in 2011, at the top of every list of predicted winners for the Newbery Medal in 2012, I knew it was time to get reading. Let me start by saying that I have given The Wednesday Wars a reading level of Middle Grade not be cause of the actual reading level or potential inappropriate content for younger readers but because I feel like the more subtle emotional aspects of this book deserve to be read by a reader who can grasp and appreciate them. Above all else, The Wednesday Wars is a book about making connections with the people around you and learning to value those relationships, which is something that younger readers, despite their intellectual abilities, might not recognize until they are socially more mature. That said, don't take The Wednesday Wars out of the hands of a younger reader who wants to give it a try! Just read the book yourself and hang around for a really great conversation when the two of you are done reading it. The Wednesday Wars reads like a very funny, eventful, even action packed, story about the ten months Holling Hoodhood's seventh grade school year. Beneath this framework are other stories and other characters growing, changing and making mistakes and making amends as the very tumultuous, historically significant years of 1967 and 1968 play out. And, wrapped around it all like a bright red ribbon are the plays of Shakespeare that Holling is forced to read every Wednesday - plays which seem to echo, at times, Holling's own life. 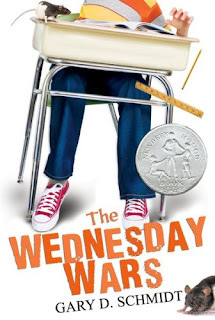 What struck me most about The Wednesday Wars as I read it, besides the fact that it is a brilliantly written story, is the way in which the narrator, thirteen year old Holling, maintains a genuinely childlike view of the world throughout the story. Which isn't to say that he doesn't grow or change as a character, he definitely does, but his perspective, which can be characterized as the self-protective myopia of childhood, allows Schmidt to naturally focus his story in on his main character without if feeling false or like he is glossing over the turmoil of the time. This nearsightedness also makes the glimmers of connection and understanding that Holling experiences over the course of the year all the more powerful. Mrs Baker, Holling's homeroom and English teacher, seems to be the catalyst for almost all that happens in Holling's life that year, in school and sometimes out. From humiliation and heartbreak to happiness and triumph, Mrs Baker is in the background almost like a stern, grammatically obsessed fairy godmother, all the while dealing with the possibility of an unthinkable loss of her own. Mrs Baker has her own reasons for withdrawing and protecting herself and perhaps this is why she seems so unconcerned and detached when Holling first encounters her during roll call on the first day of school. The way Holling tells the story, Mrs Baker clearly hates him. First, seemingly, because of his last name, secondly because he is neither Catholic nor Jewish which means that he does not leave school early on Wednesday afternoons to attend Hebrew School or Catechism. Not only is Holling Presbyterian, but he lives in the Perfect House (with the Perfect Living Room covered in plastic) in the center of town, the dividing line between the Catholic and Jewish sides of town. After a thorough grammatical lesson from Mrs Baker based on Holling's reply of, "I guess," he is convinced that she loathes him and that he needs an ally. He goes to mother who dismisses him and his fears as she furtively fans smoke from her illicit cigarette out the kitchen window. When he tries to make a case with his father his concerns are ignored and his father accuses him of doing something to make Mrs Baker hate him. Then, after figuring out that Mrs Baker is Betty Baker, married to one of the Baker boys from the Baker family that owns Baker Sporting Emporium, Mr Hoodhood tells Holling to shape up and stop threatening the chances for Hoodhood and Associates to secure the job of architect for planned renovations to the Baker's stores. A final attempt to garner sympathy and possibly even advice from his older sister are met with scorn. Holling's home life is not too great and Mrs Baker's attention, even if it seems stern and unforgiving at first, is very welcome. It really does seem that Mrs Baker hates Holling as she comes up with various tasks for him to perform on Wednesday afternoons that seem almost punitive. Cleaning the cages of the scary, yellow-tooth-clacking, scabby rats, Caliban and Sycorax, gifts from Mrs Baker's husband, Lieutenant Tybalt of the 101st Airborne Division, and cleaning the erasers from every classroom in school have results that make it seem likely that Mrs Baker is out to get Holling. And, these events seem to create ripples throughout the school that make it seem like everyone hates Holling Hoodhood as well. He wonders just how many times he will hear the words "You're dead" over the course of his seventh grade year. Just when things seem to be at their worst, Mrs Baker decides that rather than have Holling perform menial tasks, she will have him read Shakespeare, beginning with The Merchant of Venice. At first Holling thinks that this is just another form of punishment. However, as the two take turns reading it out loud and Holling begins to form an appreciation for the language. When they move on to The Tempest, Holling is astounded by what he finds and wonders if Mrs Baker has actually read the play because it is filled with astounding cuss words and curses. Holling's appreciation of Shakespeare's use of language deepens as he collects curses and practices them at home (out loud) and at school (under his breath) in preparation for the opportunity to use them, which he soon finds. "The red plague rid you!" and "Toads, beetles, bats, light on you! "as well as "pied ninny" make their way into Holling's vernacular as well as a few other students' before the book is done. Mrs Baker, through her pain at the deployment of her husband and grief when he seems to be lost in the jungle, rolls her eyes, folds her arms across her chest and gives icy stares but also begins to make a connection with Holling and take a peripheral interest in his life that at times becomes a pivotal role. Mrs Baker's behind the scenes maneuvers lead Holling to the role of Ariel in the local theater troupe's production of The Tempest which in turn leads to embarrassment (in the form of an act of revenge) for Holling as the whole school sees him in costume thanks to a newspaper stealing, yellow paint wielding thug with a big roll of tape. But, Mrs Baker's behind the scenes maneuvers also lead to something even better than a dream come true after she witnesses Holling's hero disappoint him. Of this moment Holling says, "When gods die, they die hard. It's not like they fade away, or grow old, or fall asleep. They die in fire and pain and when they come out of you, they leave your guts burned. It hurts more than anything you can talk about. And maybe the worst of all is, you're not sure if there will ever be another god to fill their place. You don't want the fire to go out inside you twice." There are many strands i this story: the Vietnam War, air raid drills, missing soldiers, a classmate who is a Vietnamese refugee, a rescue, extreme humiliation, chalk-covered cream puffs, yellow tights with feathers in all the wrong places and a bully. In fact, so much happens I wondered whether all the seeds Schmidt planted could flower by the end. To his great credit, the do. Still, while The Wednesday Wars was one of my favorite books of the year, it wasn't written for me. Sometimes books that speak to adults miss the mark for their intended audience. To see if the novel would resonate as deeply with a child, I gave it to an avid but discriminating 10-year old reader. His laughter, followed by repeated outbursts of "Listen to this!," answered my question. Best of all, he asked if I had a copy of The Tempest he could borrow. I saw you listed on the Comment Challenge so I stopped by to say "hi". Still haven't read this one (hanging my head in shame) but I LOVED "Okay for Now". You've prompted me to push "Wednesday Wars" to the top of the TBR pile, again!